NIS helps manage tight forage stocks and maintain butterfat. 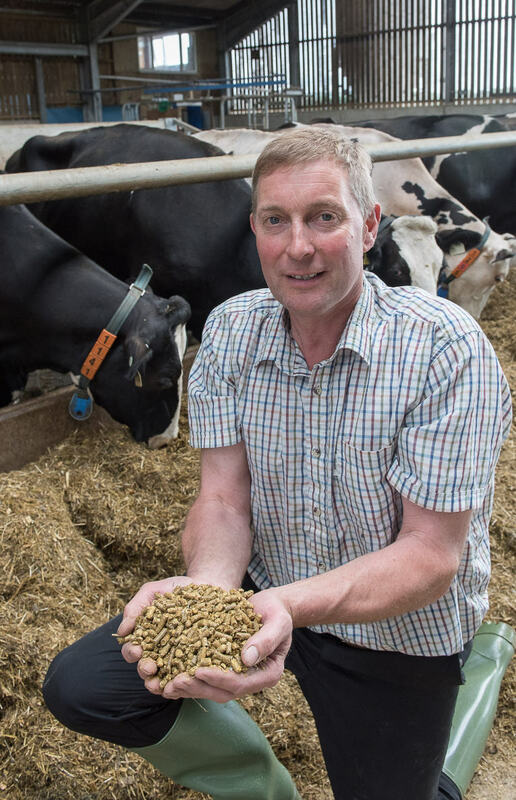 Changing how he adds fibre to his rations has helped one North Yorkshire dairy farmer make the most of tight silage stocks and optimise his milk contract. 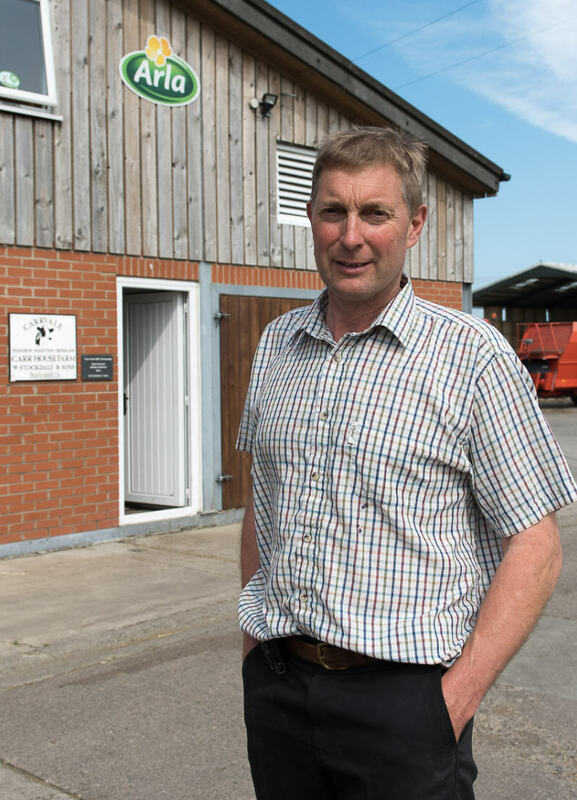 For Chris Stockdale, running the 170-cow dairy unit within his family’s diversified business at Allerston near Pickering in North Yorkshire takes careful management. The other enterprises on the 470 acre farm – including combinable crops and a 250-bay caravan site – mean Chris always has limited amounts of land available to him for growing forage. The family has nearly paid off the investment they made seven years ago in a new parlour and housing, and Chris feels optimistic that the business is in good shape, especially as prices now seem to be on the turn. His pedigree Holstein Carrvale herd is currently averaging 9,700kg per cow at 4.17% butterfat, with 3,800kg coming from forage. But as part of his effort to keep costs down, Chris is keen to reach a clear 4,000kg from forage rather than push for total yield. If the cows creep up to 10,000kg without trying, then that’s fine, but how we do it is more important,” he explains. “Getting that extra milk from forage rather than concentrate is cheaper. We also can’t afford to sacrifice butterfat on our Arla standard contract. Calving year-round, all cows are housed over the winter but only the high-yielders stay in during the summer with Chris grazing the rest in a carefully-managed paddock system from April to early November, topped up with buffer-fed TMR. The main forages he uses are grass silage, which forms up to two-thirds of the ration, maize silage and some wholecrop wheat or barley, taken opportunistically depending on the arable cropping regime and the quality of the crops in any year. The rest of the ration is usually chopped hay, home-grown cereals, sugar beet pulp, soya, distillers grains and concentrate fed to yield in the parlour. 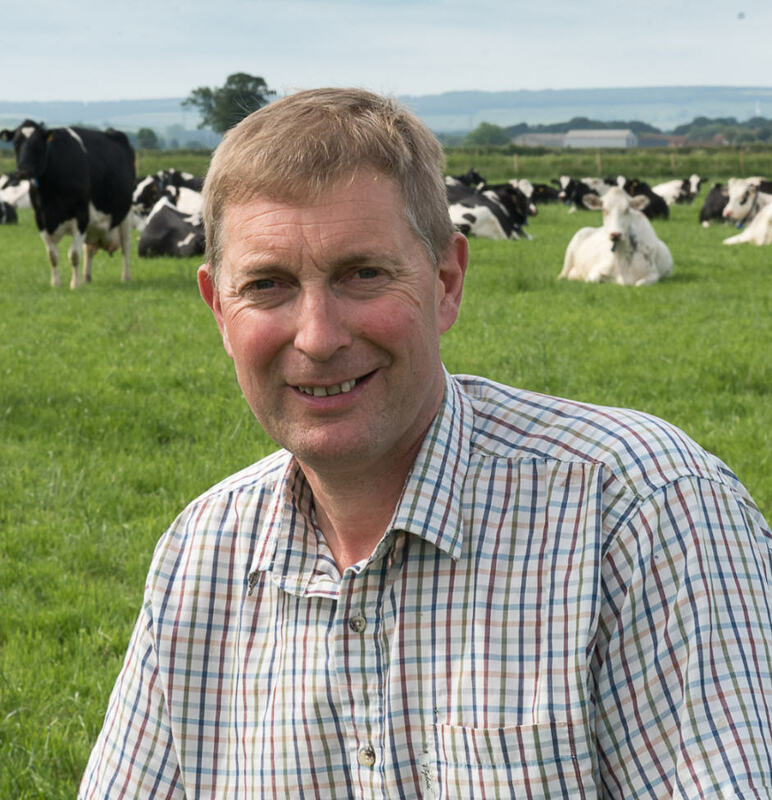 With an arable farmer’s approach, Chris manages the grassland precisely, cutting it young to leave him with high protein, high sugar and low fibre silage. But this can be hard on the cows’ rumens so he aims to balance out the low fibre content in the grass silage with maize silage to add structure and help with the rumen ‘mat’. However, growing the right quality and quantity of maize in North Yorkshire is challenging, and this leads to inconsistencies in the ration year after year. “Between the weather and the pressure on land on the farm, we inevitably harvest less maize silage than we want, and sometimes of poorer quality than we need to supply the starch needed in the diet,” explains Chris. So we feed our maize silage strategically, when we can and when we need to, stretching it out with other forages. We’ve increased the amount of wholecrop we make to partly compensate and have also had unsuccessful attempts to add straw. Chopping it to the length we want in the TMR, around 2cm, means the rest of the ration ingredients get over-processed. But working with Chris Lyth from Thompson’s Feeds, Chris found a way last winter to get more fibre into the diet through nutritionally improved straw (NIS) – alkali-treated and pelleted chopped straw. “At the beginning of housing we hit a problem when we ran out of maize. We started feeding first cut, taken early in mid-May when the grass was short, lush, very high in sugars and low in NDF. It proved a little too ‘fiery’ for the cows and they struggled to keep it inside them. Dung was very loose and we couldn’t get the cows to settle. At this point, Chris Lyth secured five tonnes of NIS on a trial basis, and the duo initially mixed it into TMR at 1.5kg per cow, increasing to 2kg shortly after. Chris Lyth picks up the story: “Pretty quickly, the cows started calming down,” he says. “Digestion seemed to stabilise and dung became firmer. We carried on using NIS in the ration to balance the grass silage until the maize silage was ready to feed, at which point we cut it back to 1.5kg in the high group. Chris Lyth reports that with cows averaging 29kg at 4.11% fat before turnout, he was pleased to see average yields move up to 31-32kg with butterfat levels holding at over 4%. Through April, May and June, the lowest butterfat dipped to was 3.95% but yields were maintained and the cows came back to averaging 32-33kg a day at 4% butterfat. However, with one problem solved, he says the other challenge was maintaining the high yielders at an average yield of around 45kg daily. 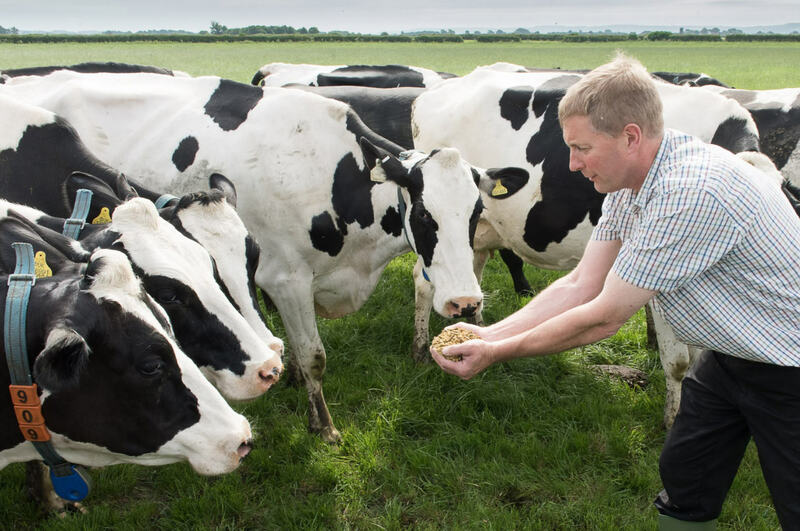 “With the arable operations Chris and his family have, it makes sense to feed as much home-grown cereal as possible, but this too has an impact on rumen health despite the grain being ammonia-treated,” he explains. The other development is that since turnout, the low yielders have been buffer-fed TMR as a supplement to the base diet rather than a replacement, with the aim of increasing grass intakes. Issues with getting enough fibre into the diet have been solved by including NIS in the buffer TMR here as well.